Whether acting as the centrepiece or simply linking other key sections of your garden together, a great lawn can be as rewarding as a beautiful bedding display. 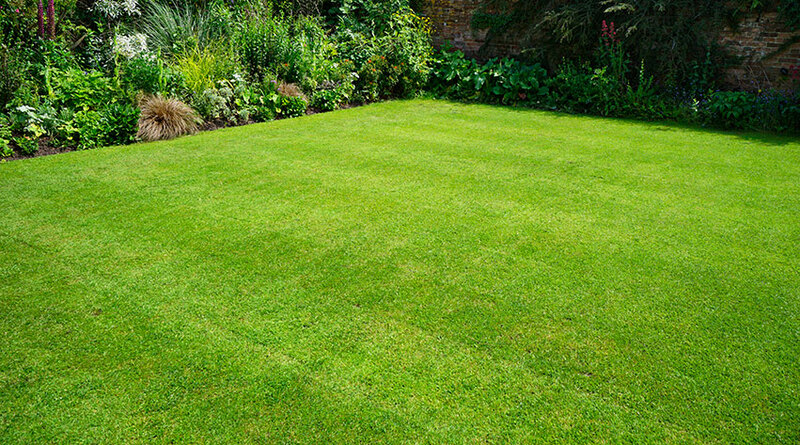 If you’re looking to grow your lawn from scratch or are looking for advice on improving what you already have, our tips to create and maintain the perfect lawn will help create that luscious green carpet you’ve always wanted. There are a number of key decisions that go into growing grass from scratch, but the first thing to consider is what the lawn will be used for. If children will be playing on it, you’ll need a much tougher strain of seed than you would if your lawn is more ornamental. Prepare the planned area before seeding by completely clearing it of any old lawn grass and weeds with a good organic weed killer and then digging out the old lawn to replace lost soil. The soil should then be broken down, with stones and any other obstacles removed. Where necessary, you should use a soil conditioner to ensure the soil is fertile and in the best possible condition. Once it’s ready, mark the soil out in square metres. This will help ensure that you get the seed ratio right. Seed should be sown at a rate of 35g per square metre, and then lawn feed added to the seed at a ratio of 1:1 by weight. It’s best to sow the lawn seed on a dry day when rain is forecast using a lawn spreader for even coverage. Moisture is essential in ensuring germination, so it may be necessary to water the lawn for several days until the seed is established, especially if there’s not much rain around. Once you’ve sown the area, it’s important to protect it from birds and other seed-eating pests. Put a net down until the seedlings have started to show. Lawns need a lot of care to keep them in pristine condition. Fortunately, as long as you carry out maintenance fairly regularly, it won’t take up too much of your time. Feed should be applied in the spring and summer months, which is when grass grows the fastest. In mid-spring (late March to April), you should use a proprietary spring or summer lawn fertiliser. This will increase vigour, as well as help to reduce the risks of weeds and moss. General fertilisers should be applied either when the soil is moist or when rain is expected. It may be that your lawn loses a bit of freshness and colour in the months around late spring and early summer (May to August or so). If this happens, repeat the application of spring and summer lawn fertiliser. Another good option is to apply 15g per square metre sulphate of ammonia mixed with four times its weight of dry soil. The soil will ensure that the ammonia is distributed effectively and won’t scorch the grass. If you prefer an organic alternative, then use chicken manure pellets. Top tip: Once August comes around, stop applying fertilisers like those mentioned above. They contain too much nitrogen and will encourage leafy growth that could then be damaged by the onset of cold weather. It is fairly straight forward to improve the quality of an already established lawn. Firstly you will need to cut the lawn on a medium blade setting and then leave it for two or three days. Make sure that the grass clippings are removed after mowing – these can be added to your compost heap. Use a lawn rake to remove any ‘thatch’ (dead grass or moss that may have built up over the soil surface) from the lawn to enable the treatment to be washed into the soil effectively. The raked out thatch can also be added to your compost heap. Apply a lawn weed and feed treatment and water in well. This will turn the grass dark green within a few days, and may lead to some temporary blackening of the grass – but this is normal, so don’t panic! Once you’ve applied the feed treatment, weeds will start to grow vigorously then will turn yellow and die. For lawns that are badly infested with weeds, a follow up treatment of a liquid lawn weed killer may be needed. After about a week, any moss in the lawn will turn black as it dies. This will need to be removed by vigorously raking it out using a lawn rake. This should not be composted. If possible, keep pets off the lawn for a couple of days until the treatment has been washed in well. After the treatment has worked, cut your grass in the usual way but remember not to compost the clippings from the first three cuts as these will still carry the fertiliser chemicals. Treat areas that are still infested with weeds using a selective weed killer that will not kill the grass. If there are patches of bare soil on the lawn once the weeds have died, these can be sown with grass seed mixed with topsoil or a loam based compost. Treat your lawn again in the autumn with a winter feed to strengthen the roots.